Marni Nathan Kloster, a native Coloradan, grew up around the law. She comes from a line of attorneys and is very proud to follow in her father’s and grandfather’s footsteps. While being an attorney is in her genes, hard work, dedication and passion are the guiding principles of her legal practice today. Marni graduated with honors from Emory University in Atlanta, Georgia, with a Bachelor’s Degree in Business Administration. She received her law degree from the University of Denver College of Law, again graduating with honors, including the Order of St. Ives. 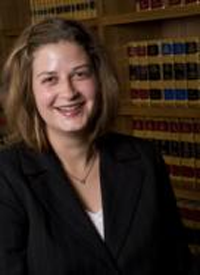 She completed her Juris Doctorate in May of 2003 and was admitted to the Colorado Bar in October of 2003. Marni worked for this firm for more than two years as a law clerk during law school. She became an associate in 2003 and was made a Shareholder of the firm in January of 2007. During her tenure, Marni has specialized in representing governmental entities across the state in a wide variety of matters, although she also works on other matters as an insurance defense lawyer. She has engaged in the defense in a vast number of different types of claims including, but not limited to, civil rights claims, auto and premises liability claims, land use claims, and employment matters that often relate to the First Amendment, Title VII, ADEA, ADA, due process, and CADA actions. Marni has experience in state District Court, the Colorado Court of Appeals, the Colorado Federal District Court, the Tenth Circuit Court of Appeals, the United States Supreme Court and administrative agencies such as the EEOC and CCRD. Marni also has experience in performing employment investigations for employers based upon complaints received from employees and in defending employers during disciplinary hearings. Marni is an AV Preeminent rated attorney through Martindale-Hubbell and has been named a Super Lawyer Rising Star in three different years. A few examples of court decisions Marni has been involved in include the following: Along with several other attorneys in this firm, Marni defended the City of Littleton in City of Littleton v. Z. J. Gifts D-4, L.L.C., 541 U.S. 774 (2004). Specifically, she assisted with the appeal to the United States Supreme Court, which resulted in a 9-0 decision in favor of the City of Littleton. Marni has also been involved in obtaining summary judgment or dismissal with respect to claims against her clients on a number of occasions during her career, such as in Musick v. Pickering, 2005 U.S. Dist. LEXIS 25611 (D. Colo. 2005); Rose v. City of Lafayette, 2007 U.S. Dist. LEXIS 9839 (D. Colo. 2007); Wilson et. al. v. City of Lafayette et al., 2010 WL 1380253 (D. Colo. 2010); Duran v. City of Monte Vista, 2012 WL 764458 (D. Colo. 2012); Benton v. Town of South Fork et. al., 2013 WL 1324385 (D. Colo. 2013); and Lester v. City of Lafayette, 2015 WL 881677 (D. Colo. 2015).